I have written about Skip Jutze before. But as sg schier pointed out in a May 30 comment attached to that first Skip Jutze post, I got it wrong. But how could I get it right? How could I ever hope to say all there is to say about Skip Jutze? And I feel that tingling, excited sensation again, the one I get when I know I’m about to get it wrong. It’s not a bad feeling. In fact, it makes me feel alive. I get it when I’m holding one of my baseball cards from my childhood and starting to glimpse the glittering possibilities embedded like a lode of diamonds all over in the card. It’s like that Beatles song. It’s all too much for me to take. The love that’s shining all around you. I know I’ll get it wrong. I can’t possibly say it all. Skip Jutze! Here he is, a couple years before his appearance on the card I’ve already written about, younger than that doleful sky-gazing mustachioed journeyman on the Mariner card, the younger Skip Jutze looking directly into the camera with the adamantine confidence of an athlete who has been second to none for almost all of his life, a superstar in every sport he played, a hometown legend. The confident look prevails despite the data on the back of the card, the birth date acknowledging that he’ll be turning 30 in May, the .226 lifetime average, the lack of even a single career home run. The front of the card is no different: The lopsided layout cheapens what already must be a card nearly devoid of worth. The empty stands hint at Skip Jutze’s status as a guy to be gotten out of the way early by the Topps photographer, before the regulars swagger onto the field. The polyester rainbow of his uniform seems cheap and desperate, especially since the number on Skip Jutze’s pants, 9, does not match the number, 23, on the bottom of the bat in Skip Jutze’s hands. He is a spare part, just passing through, briefly flickering between the minors and the majors, tossed a leftover uniform and a random bat. And yet, taken all together, the confident look, the paltry stats, the garish uniform, above all the name, Skip Jutze, immune to renown, it all speaks to me not of failure or success but of something beyond that false duality, the sweet stinging tension of life itself, our moment alive, holding with all our might to might, to if, to maybe, to the brink of another bright uncertain day sparkling and sharp with the diamonds of possibilities and mistakes. I started Cardboard Gods a little over two years ago when I randomly grabbed from my shoebox full of aging cards my one and only Mark Fidrych card, an amazing stroke of luck considering the fact that there’s probably no other player who embodies for me the dreams and joys and disappointments of childhood and its endless shadow than the ebullient curly-haired nutjob rookie, the Bird, who ruled the American League for one slim beautiful year before breaking his wing and dropping almost instantly out of sight. Holding his card, I got that tingling, excited sensation. I was very glad to be feeling it. The worst thing in the world is if you start feeling like you’ve somehow got to a point in your life when you can’t make any more mistakes. For one reason or another you’ve marginalized yourself, removed yourself from the game. I had spent the previous years working on a novel and upon the messy uncertain completion of the book had been unable to publish it. I felt worn out, empty, demoralized, buried, removed. I needed to get back the feeling that I was still alive, that mistakes were still possible. Enter the Cardboard Gods. After only a week or so of profiles I found myself writing what seemed to be a particularly dull ode to Otto Velez. I wondered if things had run their course. For months after that I’d periodically circle around to that Otto Velez feeling. Certainly, on any rational level the whole project was ludicrous. OK, write a few things about your baseball cards and then move on with real life. But dedicate yourself to it indefinitely? I have been doing this for a couple of years and I have only covered a fairly small percentage of the baseball cards from my childhood. There are still so many mistakes to be made! I want to infect every card I own with my failings. I want to make a single-minded effort, one continuous mistake. I want to get every single Cardboard God wrong. 2. Is “shoshaku jushaku” Japanese for Skip Jutze? – You often spot things in the card (e.g. mismatch between numbers, layout, background, expressions, pose) that I almost always overlook. You do an excellent job of noticing and evaluating and adding meaning to what otherwise might be a simple experience of viewing the image of a player. – You often find bio bits (implying inaccuracies aside) that I’d never bother to look up myself. – You tie something about the card and or player to something larger or smaller, and by that, give me something to think about. 4. 2 : I don’t know the answer to that question. It’s a good one. I’d also love to know the etymological roots of the word “Jutze.” I believe Alfred Henry Jutze (his real name) is a landsman, so maybe the surname is Yiddish. 5. As a historian, I’m convinced that someday, those hideous uniforms will be a symbol of something wrong in the American psyche. In the meantime, do please stay in the game. 6. Josh – I hope you keep doing this for a long, long time. My day wouldn’t be complete with a stop here (along with Neyer, Posnanski, Rany and Shyster) to read your terrific writing. 7. Josh – I hope you keep doing this for a long, long time. My day wouldn’t be complete without a stop here (along with Neyer, Posnanski, Rany and Shyster) to read your terrific writing. For as long as you continue writing about the Cardboard Gods, I’ll be along for the ride. 9. That’s the Josh Wilker I’ve come to enjoy reading nearly every day for the last couple months. You’re excellent at what you do. My wife, who suffers from bipolar disorder and battles daily with writing and trying (not necessarily in that order) has said one thing to me that is most important in dealing with writing. You’ve got one, Josh. No one else on the internet is swinging this stick, and I can tell you from being a bookstore wanderer, I don’t think anyone else outside of the web is either. As Andrew “Dice” Clay used to say, “You’re the Goods.” Keep swinging, Josh, you’re loved. 10. 5 : Something wrong . . . or possibly something very, very right. I go back and forth on that one. Anyway I’m glad those Astros uniforms existed. 6 – 9 : Thanks, gents. That’s much appreciated. 11. Hi there, just got turned onto your blog by a new friend here in Vancouver. Thanks for the Eckersley entry, I spent many a childhood night at the Coliseum, heart pounding as Eck toted his sub 1 ERA onto the mound and continued the myth of the closer. I’ve since become a Red Sox fan, but the mystery of the game will always be in Oakland for me. Thanks for the reminder of that. 12. If Cardboard Gods is wrong, then I don’t want to be right. 13. I’m about to start my own business. It’s a small thing — a company of one. My work isn’t in a growth industry, and I’m not a natural salesperson, but I’ve made a few contacts and I do my job well — I hope that to be enough to carve out a little something. All of my savings is going towards the start-up, and if I fail I’ll be living in someone’s basement in six months. Those words perfectly encapsulate my anxiety, but there’s an element of challenge in them that helps inspire me to push onward. So thanks, Josh. 14. 11 : Thanks for checking in from Vancouver, canadiansagainsthockey. My most vivid memory of Eck as an A was him mowing down the Red Sox in the ’88 playoffs with absolutely no resistance whatsoever from the hopeless batters. 13 : Best of luck, sansho1. Thanks for sharing those thoughts. 15. Hmm. “canadiansagainsthockey” is an interesting moniker. 16. Seeing this exact Skip Jutze card just shot me back almost 25 years to when I was 10 years old. My parents had recently divorced and they sold the home I’d grew up in. A home in a neighborhood near all of my friends. My Dad moved into a crummy apartment complex and my Mom and I moved into a small condo far away from my friends, but still in the same school district. That summer I spent the majority of my time by myself, sorting my own Cardboard Gods and watching the old ESPN “Baseball’s Classic Games” hosted by George Grande on ESPN. I’d watch and rewatch them all day. One day I was bored and decided I was going to bury a “time capsule” in the woods behind the condo. I grabbed a ziplock bag and put all kinds of little trinkets, notes, etc into the bag and buried it out back. This Skip Jutze card was in that bag. 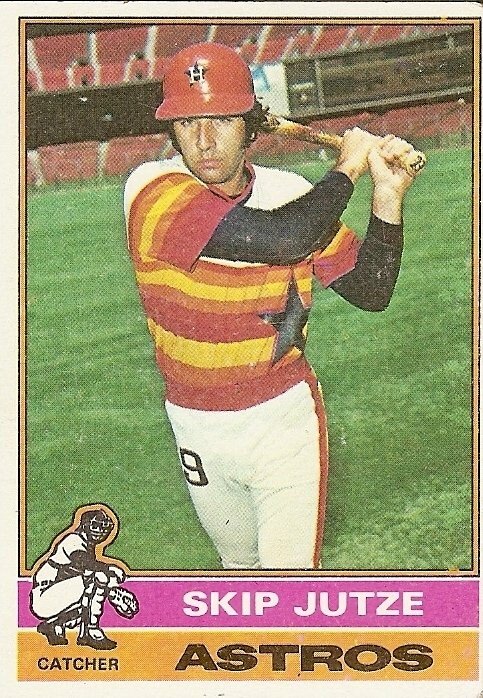 I always liked the card because of his name, the Astroturf, the horrible stats, the orange batting helmet, and the wild look of those old Astro uniforms. Anyway…this card just jarred some memories I haven’t thought of in many years. That was the lonliest of summers, but it was a time in my life where my baseball cards were of great comfort. Thanks for the great stories Josh. Keep them coming. 17. 16 : Thank YOU for the story, GB5HOF.